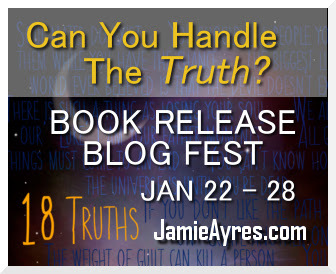 ← Can You Handle The TRUTH Blogfest (Kinda) Signup! I’m going to say the third one is a lie, just because it sounds the most likely. I think 3 because I really want the second one to be true and I don’t think you’d lie about your husband…hmm. I’ve put a note in my diary to come back on 28th. I agree with Debbie. I think 3 is the lie. You don’t look old enough to have taught for 13 years. I’ll post mine on Friday. Congrats on your new book! Very exciting! Okay, I’ll ❤ you forever for that comment, lol! Great trailer! Love the story about how you met your husband, and the international mission trips. I also think that #3 is the lie. Thanks for hosting this fun blog fest Jamie! Cool trailer! I’m going to guess that #2 is the lie…all of them sound feasible, I just feel comfortable guessing #2 for some reason. Congrats on the upcoming book release! I’m guessing #2 is the lie. This has been a fun blog fest. Hope it gives your book some good exposure! Okay, I’m guessing number two is the lie. The husband story rings true and I’m pretty sure you’ve been teaching a while. You’re too good at it to be a newbie! I’m going to guess #2 is a lie, but only partially, like you really did the trips but didn’t meet both of those celebrities. I believe you save a child’s life and the husband part rings true for some reason. I hope to join this hop later, gotta run to work. I’m going to say #2 because why couldn’t you know that your husband-to-be was your true love. Also, my husband saved someone from choking once, and I know how easily it can happen. I’ll make a note to myself to come back on the 28th. Nice thoughts 🙂 See you on the 28th for the big reveal! Interesting, because part of the statements you made might actually be true while the rest is exaggerated! So it’s between 2 and 3, and because you seem gregarious enough to have met some celebrities, I’m going to go with 3 being the ‘Lie’. I totally believe you could save a child’s life though! I like your reasoning! All these lies are killing me, lol! Great book trailer!!! And I think it’s #2. Hmmm…..I think the lie is number 3….I know you have been teaching but I don’t know how long and you are such a wonderful person I think you have been on missions trips…. Aww, you’re too kind, Shannon! I love your convoluted thought process, lol. So glad you found me through our head Ninja Captain–he rocks! Thanks, Kourtney . . . it has been tough! Sounds very interesting, though I don’t know you well enough to guess. ^_^ I’ll believe #1 is true, though, because sometimes there are things we just know. Heh! Might have to participate if I can remember to make another blog entry in the next two days. Wonderful blog fest, I came a bit late to the party, but I am really enjoying it. For you I am guessing number 1 is the lie, only because my daughter is nearly 14 and I can’t imagine her meeting someone she might know she will marry. Scary thought, isn’t it, Rhonda? My daughter turns 14 in June . . . they grow up waaaay too fast! Oh, these are tough! Great facts, Jamie. I’m guessing 2 is the lie. although it’d be awesome if they were all true!